Ferries are set to sail between Florida and Havana once again more than 50 years after services were halted at the height of the Cuban Missile Crisis. Around half a dozen companies have expressed interest in reviving the once-popular route following the historic easing of travel restrictions between the U.S. and Cuba earlier this year. 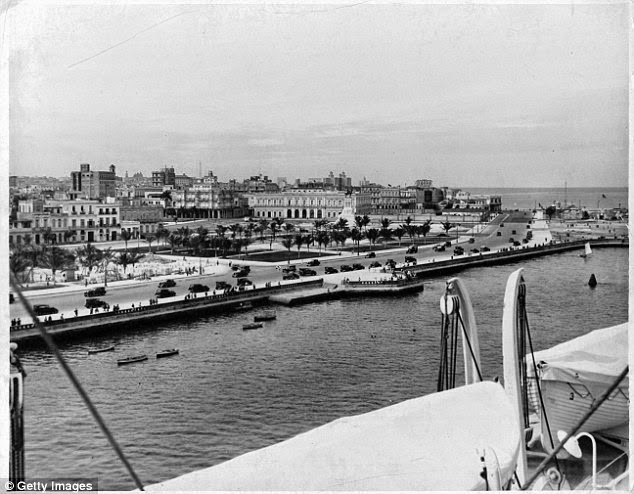 Ferries to Cuba were immensely popular during the 1940s and 1950s but services ended on February 8, 1963, when President Kennedy imposed travel restrictions on Americans visiting Cuba. One firm keen to exploit the new developments is Fort Lauderdale-based CubaKat which is planning to run a high speed passenger catamaran service beginning in December. Boats would leave from a private marina in Marathon key, about 135 miles (217 km) from Havana, offering a high-speed $338 round-trip ferry service with a capacity for about 190 people, as well as some vehicles. The crossing would take around four- hours and cost $169 one way or $338 round trip. General U.S. tourism travel to Cuba remains banned with travel restricted to family visits, educational or religious trips, humanitarian efforts, journalism or government business. However the federal government has no way to enforce it and last year some 650,000 people visited Cuba from the United States, a figure some experts predict will race past 1 million in the next few years. At least half a dozen Florida companies are seriously considering ferry ventures, with plans to seek licenses from the U.S. Treasury Department. Among these is Miami-based United Americas Shipping Services - part of a major shipping group with passengers and cargo operations, including Baja Ferries on Mexico's west coast, and Unishipping, a privately-owned, Paris-based company. United Americas President Joe Hinson said the company has met with officials from south Florida's three main ports in Miami, Tampa and Fort Lauderdale. It plans to offer a 10-hour, overnight service with sleeping cabins and dining facilities. On December 17 last year, the United States and Cuba announced their intention to restore diplomatic relations. Last month, the Obama administration made some moves to loosen some travel and trade restrictions. While charter airlines already run scheduled services to the island, no licenses for ferry service to Cuba have been issued, according to the Treasury Department's Office of Foreign Assets Control (OFAC), which enforces sanctions. U.S. officials have not commented on the status of requests for ferry licenses. Granma, Cuba's official Communist Party newspaper, published an article on Feb. 11 by two Cuban foreign ministry officials saying Obama could use his executive authority to permit ferry services between the two countries.